As much as eighteen people died last night in a multiple accident on the Lagos-Ibadan Expressway. The accident, which occurred around 6.30 p.m at the Alapako corridor of the expressway, involved an Extera Sport Utility Vehicle (SUV) with registration number (Lagos) KJA 278 DS, an unmarked Ford and a bus with registration number (Lagos) GGE 873 XU. It was a shocking sight. 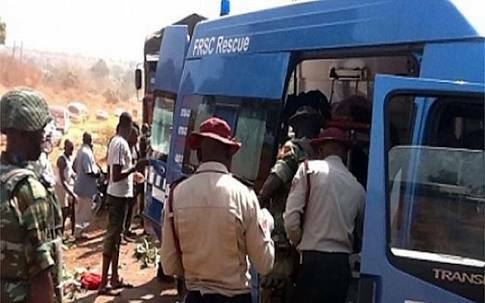 Operatives of the Ogun State Traffic Compliance and Enforcement Corps (TRACE) and the Federal Road Safety Corps (FRSC) were on the scene of the accident to evacuate the victims, clear the obstructions the wreckages caused and direct traffic. TRACE spokesman Babatunde Akinbiyi, who confirmed the accident, attributed it to reckless overtaking. Akinbiyi added that the agency’s operatives had taken the remains of the dead to the FOS mortuary at Ipara-Remo in Ogun State.